My kitchen is my happy place. When Neal and I designed our home, we wanted the kitchen to be open to the family room because our family and friends always want to gather in the kitchen. 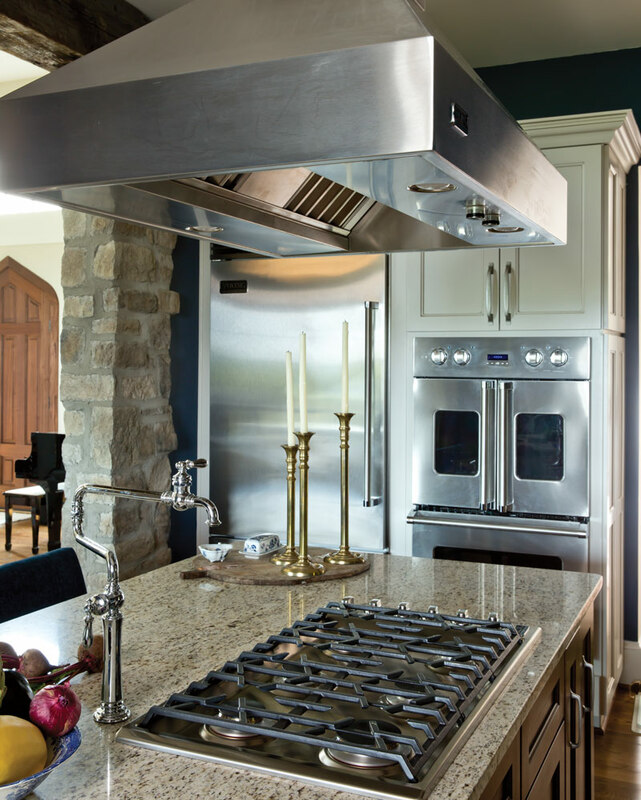 My cooktop faces the family room so I can enjoy conversations and hear the latest news when we have company. It’s great because I can finish the meal and still be a part of the conversation. I love the extra wide counter chair—it’s a great place to sit and talk while Neal or I cook, and it is just perfect for my grandchildren. Being short, I opted out of overhead cabinets and instead, built a large pantry where food and dishes are stored. The two cabinets in my kitchen where my blue and white dishes are displayed were designed to look like antique cabinets. They are actually new cabinets with seeded glass panes that make them look really old. The appliances were very important to me. I absolutely fell in love with the Viking French-Door Oven; it’s just what I needed. The doors open out to the sides, so I can get closer when I am putting food in the oven. The bottom oven has never been a problem for me to reach, so it has the traditional pull down door, but the French door on top has made using my oven so easy. Viking’s oven doors operate in tandem. When you open one, the other one opens with it. 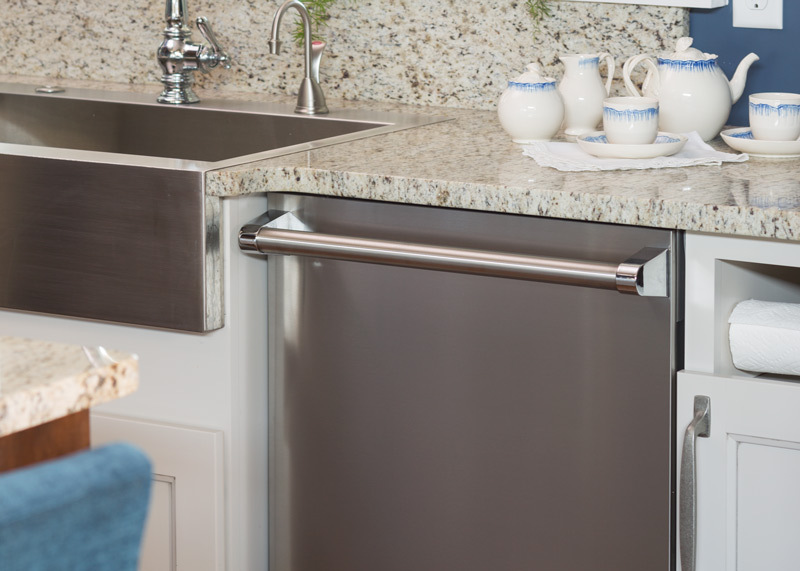 I also loved the large rod handles on all the appliances. It makes them so easy to use. The refrigerator has a bottom freezer making it much easier for me to see what I have stored there. Also, I have an Undercounter DrawerMicro Oven that you load from the top. When I need to check the items in the microwave, I just look right down into it. Lifting things from it is much better for me—the drawer slides out, and you just reach in and get the food. It is important to design your space to suit your height and needs so working in your kitchen is easy and hassle-free. I spend a lot more time cooking in my kitchen because I enjoy using the appliances that I’ve chosen—they’re perfect for me. When you are remodeling or planning your space, think about what works for you. Being able to reach things comfortably makes cooking fun! 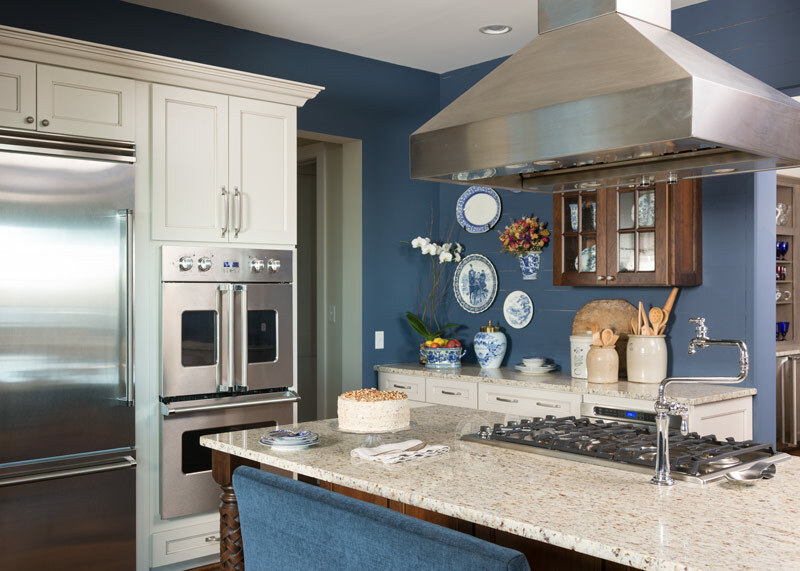 The lovely blue color on my kitchen walls is Benjamin Moore Newburyport Blue. What do you like most about your kitchen? See my full home tour in the issue below! I, too, covet that French-door oven! We remodeled our 1952 galley kitchen in 2013 but had limited space to expand, so I only have the small Viking wall oven. My husband picked out the stove, which got us started with Viking on the rest of the appliances. It is white and looks vintage. The rest of the space was opened with a half-vault ceiling and by knocking out a load-bearing wall, which was replaced with a cherry-topped eat-bar peninsula. The cherry countertops were all varnished with marine-epoxy coating and look beautiful with the sage-green walls, white bead board and cabinets. I have a tiny marble counter for baking, and a big (relatively) industrial-grade stainless steel counter where everything seems to happen, also my husband’s inspiration. But my favorite thing is the red dishwasher, which was a floor sample. It can only be seen when standing in the kitchen, but it makes me happy, so cheerful! I have a green-and-red color palette to accentuate my dishes — my Grandma’s Franciscan Apple, some on display in lighted upper mullioned-glass cabinets. So cute! We live near the beach, so the rest of our house is also petite. I enjoyed viewing your blue kitchen and seeing the photos (Blue Calico are my “company” dishes, along-with daffodil-patterned random teacups). Thank you for sharing, and for the daily small pleasures of your blog! The Viking Oven with French Doors would be at the top of my “wish list”. I have 3 different sizes of Le Creuset round dutch ovens…from 8qt down to 3 1/2 qt and absolutely love them. However, as I have reached my 75th birthday and shrinking in height, putting those naturally heavy ovens on to the rack in my oven has become a problem. Fill them with heavy food and liquid and it’s almost a disaster waiting to happen…all because my oven is built in at waist-high and the door is deep and opened fully requires a heavy lift and push forward. I would find bending down to put heavy pots into an oven under the cooking surface on top to be difficult as well. I now remember my sweet Mom doing that with the heavy cooking of Thanksgiving turkey and the bulky casseroles. Viking seems to have solved both problems. 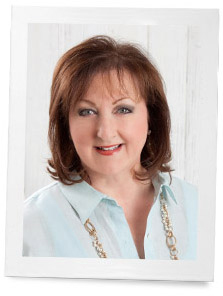 Phyllis, your kitchen tour and blog gives us wonderful insight and many ideas….you were wise to do the research and then careful planning for your new kitchen. I am 4 ft 10 inches now, shrinking as I get older. I love the blue color. What thoughtful things you have incorporated in your kitchen. Has given me an idea about color in my kitchen. We just bought living room furniture in shades of blue, got tired of the green and brown. Now I will redo the dining room and kitchen. I have a huge collection of roosters and a lot of them I now notice have blue in them. You must love to cook and bake in your kitchen. Thank you for the tour of your beautiful kitchen!! We have a blue and white kitchen and a collection of blue and white dishes. Off the kitchen is a formal dining room with white waynes coating. We recently had the inside of our house painted, and it was suggested that we paint the wall above the waynes coating in the dining room royal blue. 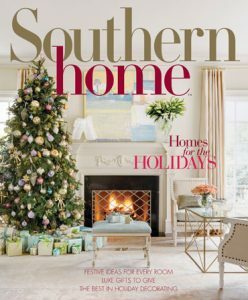 When I received my December copy of Southern Home (I just recently subscribed) with the photographs of your new home, I saw the blue wall in your kitchen – its beautiful!! You gave me the courage to have our wall painted blue – we love it!! Thank you so much for the inspiration and for your wonderful blogs – I look forward to each one. Phyllis, your hospitable spirit is so evident in the open, bright and warm kitchen you have put together. I love your colors and arrangements of blue and white. So beautiful! No wonder your kitchen is your happy place! No wonder folks love gathering there. So comfortable and welcoming! We love having family and friends to our home. It is so much fun. It looks fantastic. I love my induction stovetop (we don’t have gas in my tiny village), but I hate the ovens. The doors open kind of like your French doors, except each oven has just one door. One oven has a tray on the door, which seems great, except that it’s really hard to grab any dishes or pots that don’t have handles, because the tray is deep (and gets hot). The racks don’t pull out–that’s a detail I sorely miss. It sounds like you did better research! You know, I had Viking before in my last house so I knew that was what I wanted. The French-Doors are new for me and I love them. I can walk right up to the oven with casseroles in hand. Pop them in, bake them, and then taking them out is so much easier for me. At only 4′ 11″ tall, I can certainly relate! What a blessing for you to have been able to make a custom kitchen truly “fit” your needs. I’ll keep dreaming about doing that one day for myself! Thanks for sharing your personal space with all of us!! Being five feet tall,I love the French door oven! Appreciate the handles also.Congratulations on a wonderful design!. Oh my goodness Phyllis! Your kitchen is fabulous! I love the French oven doors but, I love the big pantry idea. I would love walking in a pantry and getting what I need instead of trying to reach them in upper cabinets. I have a being short issue too! So happy for you and Neal! I love the pictures of your beautiful kitchen. It will always be lovely like you! I love, love, love, your new kitchen!! It’s just beautiful! I am so happy to see this beautiful kitchen and your appliances! I am short and the microwave and oven would solve a lot of problems for me! I was just talking to a friend today about a kitchen remodel, and these ideas are wonderful. Enjoy your beautiful new home. Phyllis, we were talking about you today. Assistance League Mobile is preparing for our fundraiser this year in April. Can’t believe a year has passed. You were so special last year and we were reminiscing about Neal and your visit. At that time you shared many details about the lovely new home that you were building. I have enjoyed reading your journal this past year and seeing it come to fruition. The kitchen is gorgeous, and yes, it is the heart of a home. Wonderful to see Neal and your dream come true. Carol!!!! Has it been a year. Wow. We loved every moment with you. Thank you for asking me to speak. It was a wonderful day. Best to you and all the ladies in Mobile. Thank you for the opportunity to see your gorgeous kitchen. It is very kind of you to be willing to share it with us. What a blessing! What a gorgeous kitchen. Everything is so lovely. I love those love the white and blue. Gorgeous! Blue and White never go out of style. Love the beautiful room. Thank you so much for sharing pictures of your kitchen. It’s absolutely beautiful. I would never want to leave it! What a lovely kitchen! Thank you for sharing it with us. Beautiful! Thank you for the “tour”. I love everything about your beautiful kitchen. THanks for the op to see it ! THis is the first I’ve heard of the French oven doors ! Impeccable taste ! Thank you for sharing your kitchen with us. It is beautiful. Love your colors and appliances choices. I think I would really like the French door oven. I also love to use old crocks and bread boards . I collect butter molds and see that you have one on display. Enjoy your great kitchen. I need to look for that magazine so that I can see some more of your beautiful home. Perfection! I love hat you put so much thought into every detail. Beautiful! Hope you continue to enjoy it for years. Love the blue. You did a tremendous job in achieving the desired effects with the emphasis on your love of cooking, baking, and being able to interact with your family and friends. 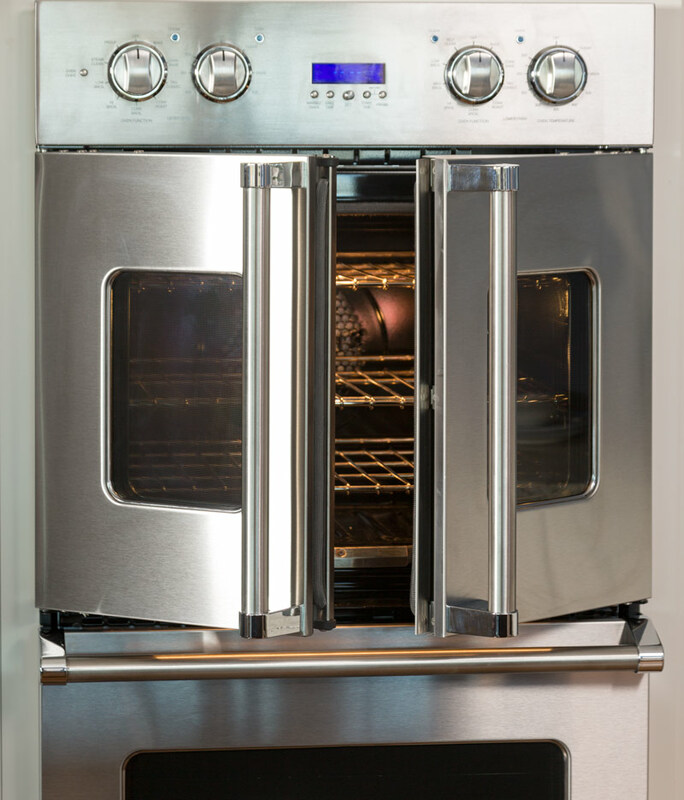 And…oh I wish we could had a Viking French Door Oven when I was younger. It makes life so much easier for those who love to bake. Well done Phyllis! My eyes are so green with envy! My favorite thing about my kitchen is the color. The walls are a vibrant blue and my cabinets are white. My husband and I chose this combination in 1993 when we had the kitchen remodeled, and we still love it. I throw in yellow accents whenever I can. Thanks so much for a glimpse into your kitchen, Phyllis. I love it. I love your kitchen! 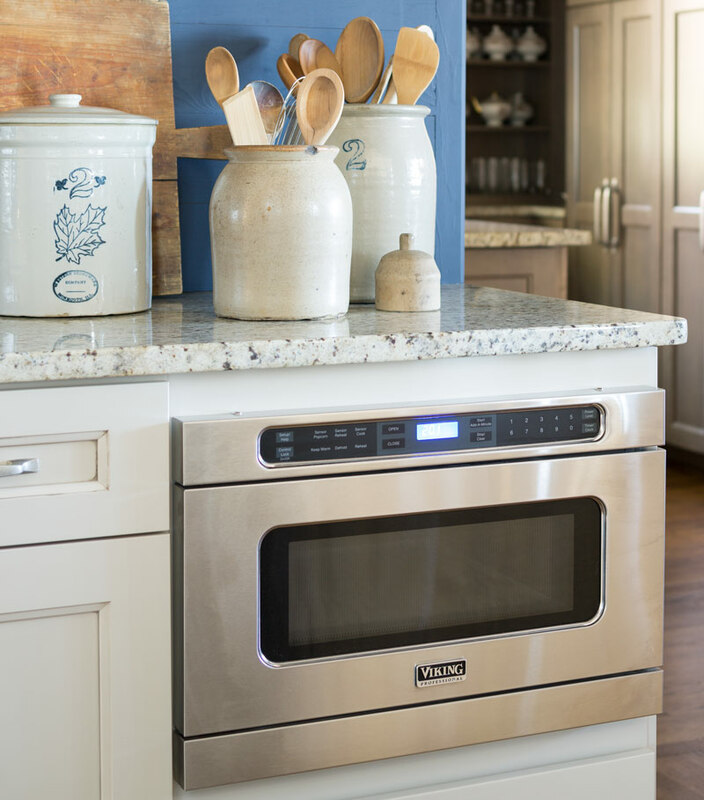 That French door oven is gorgeous!! We have a small kitchen here at FrenchGardenHouse, but I do love it. We put in a smaller size Wolff range which I adore. It makes cooking every day slap blessing! But your oven makes my heart go putter patter. So handy. I love the blue and white chairs, too. What is your counter top material and color name, please. Beautiful kitchen! Gayle the counter top is granite-Giallo Ornamental. It is not expensive and I was trying to find something that was very muted. I used it in the pantry too. I use every inch of my kitchen and needed something that was not high maintenance. First let me say that I do not cook. I did cook when our kids were little but now my husband cooks. The best thing I make for dinner are reservations. I asked my husband to take me on vacation to somewhere I’ve never been before. HE TOOK ME TO THE KITCHEN. Great article. I really enjoyed taking a peek inside your beautiful home. Phyllis, your kitchen is beautiful. I really love your oven and the French doors. I had double ovens in another house and absolutely loved them. I have a very spacious kitchen with granite counter tops. I have lots of counter space and large pantry. I also like your chair for sitting in the kitchen. Your table and chairs are beautiful. Love the blue. You are going to have many happy moments in this beautiful space. Do you have the paint color name? Love it! 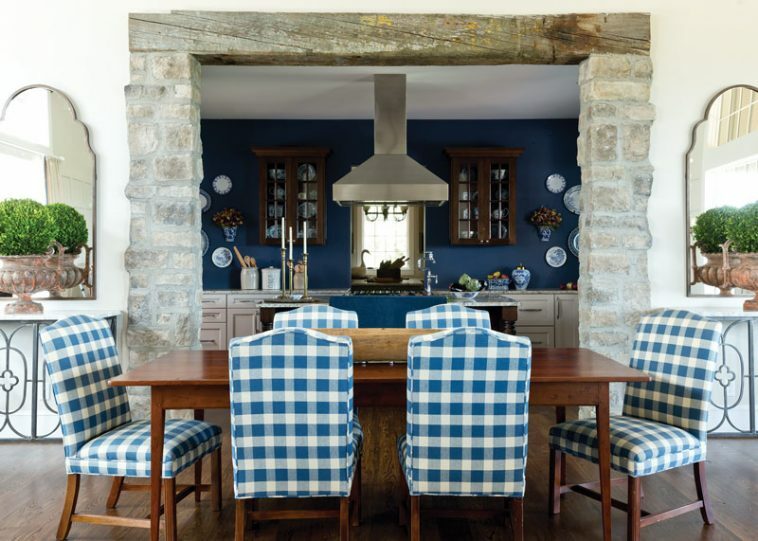 Newportbury Blue by Benjamin Moore. The back wall is painted shiplap and the rest are sheetrock. I love the texure of the boards in the back. Your kitchen is awesome….my colors for sure….I know you will enjoy for many years to come. God Bless You! Adore your kitchen. We had a Viking cooktop in our New Orleans kitchen. When Katrina hit it was the only surviving appliance. Last summer we remodeled our current kitchen and I chose Viking again. This is my second kitchen with Viking too. Thank you for sharing. Unfortunately the rest of my comment got cut off. My second Viking kitchen is a nightmare. The cooktop has never worked properly and we’ve had numerous service calls to no avail. At this point, I’d love to swap it out for a Wolfe but I have a Viking shaped hole in my gorgeous quartz counter. Any suggestions?